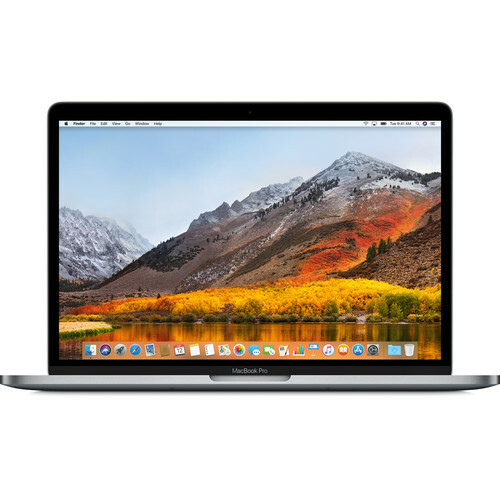 The space gray mid 2018 Apple 13.3" MacBook Pro with Touch Bar has been upgraded with an 8th Generation Intel Core processor, True Tone display technology that automatically adjusts white balance to match the color temperature of the surround light, Apple's T2 coprocessor chip, and a quieter keyboard. All of this helps to create a more powerful and versatile system system for photographers, video editors, 3D graphic designers, gamers, and coders. This system is powered by an 8th Gen Coffee Lake 2.3 GHz Intel Core i5 Quad-Core processor that features a burst speed of up to 3.8 GHz, while 16GB of 2133 MHz LPDDR3 RAM helps to ensure smooth multitasking and also allows the computer to quickly access frequently-used files and programs. The system memory cannot be upgraded. The 13.3" MacBook Pro includes a 61W USB Type-C power adapter that operates using 100-240 VAC at 50-60 Hz, a 6.6' USB Type-C charging cable, and a built-in 58Wh lithium-ion polymer battery that lasts for up to 10 hours before recharging is required - or up to 30 days of standby time. With an 8th Intel Core processor, the MacBook Pro reaches higher heights in compute performance. The 13.3" model now features a 2.3 GHz Intel Core i5 Quad-Core with up to 3.8 GHz Turbo Boost speeds that are up to twice as fast as the previous generation. So when you're powering through pro-level processing jobs like compiling code, rendering 3D models, adding special effects, layering multiple tracks, or encoding video, you'll get everything done. Faster. For faster performance when working with large files, or running multiple pro apps or virtual machines, the 13.3" MacBook Pro can now be configured with up to 16GB of 2133 MHz LPDDR3 memory. The 13.3" model with Touch Bar features powerful integrated graphics with 128MB of embedded DRAM - twice as much as the previous generation - which accelerates graphics tasks. That means more time for what matters most - creating your work. Blackmagic Design has created an external GPU (eGPU) for the MacBook Pro (sold separately). So you can have desktop-class graphics performance without giving up the portability of a notebook. Housed in an all‑in‑one aluminum enclosure, the Blackmagic eGPU is powerful yet quiet, charges your MacBook Pro using Thunderbolt 3, and has built-in I/O connections to drive both a Thunderbolt 3 display and VR accessories simultaneously. With the Blackmagic eGPU and MacBook Pro, you can accelerate pro apps, create VR content, and enjoy smooth gaming. Introducing the Apple T2 chip, a second‑generation custom Mac silicon designed by Apple to make MacBook Pro even more secure. Featured on the 13.3" model with Touch Bar, the Apple T2 chip includes a Secure Enclave coprocessor that provides the foundation for secure boot and encrypted storage capabilities. It also consolidates many discrete controllers, including the system management controller, audio controller, and SSD controller, into one. And the Apple T2 chip brings a familiar voice to MacBook Pro - Hey Siri is always ready to open apps, find documents, play music, or answer your questions. The MacBook Pro includes a solid-state drive that is fast, with sequential read speeds up to 3.2 GB/s and sequential write speeds up to 2.2 GB/s. The 13.3" MacBook Pro with Touch Bar is available with up to a 2TB SSD - enough space to take even your biggest files with you, like large photo libraries or video projects. So you can boot up, launch multiple apps, or import huge files in a flash. And with the Apple T2 chip, everything is automatically encrypted on the fly. Thunderbolt 3 combines high bandwidth with the versatility of the USB Type‑C industry standard to create one revved‑up universal port. It integrates data transfer, charging, and video output in a single connector, delivering up to 40 Gb/s of throughput for twice the bandwidth of Thunderbolt 2. Both sizes of MacBook Pro are available with up to four ports, so you can do all of that from either side. Existing devices are easily connected with a cable or adapter. Since Thunderbolt 3 is reversible, no matter how you plug in, it's always right side up. The Touch Bar replaces the function keys that have long occupied the top of your keyboard with something much more versatile and capable. It changes automatically based on what you're doing to show you relevant tools that are intuitive to use - system controls like volume and brightness, interactive ways to adjust or browse through content, and intelligent typing features like emoji and predictive text, just to name a few. Many Mac apps, such as Final Cut Pro X, Photos, Logic Pro X, Mail, and more have Touch Bar controls that make common actions like sending an email or formatting a document even easier. The Touch Bar changes to match the app you're using, bringing these shortcuts front and center. And third-party apps can take advantage of the Touch Bar as well. Unlock your Mac in an instant. Use Apple Pay to make secure online purchases. Quickly access system settings and locked notes. And even switch between users - all with the touch of a finger. The Retina display in MacBook Pro features bright LED backlighting and a high contrast ratio, delivering deep blacks and bright whites. It supports P3 wide color for even more vibrant greens and reds than with sRGB. And this 13.3" model with the Touch Bar features True Tone technology. The white balance automatically adjusts to match the color temperature of the light around you for a more natural viewing experience. MacBook Pro also has beautifully balanced, high‑fidelity sound that takes listening to higher levels with wide dynamic range and more bass for increased boom. The speakers are connected directly to system power, enabling greater peak amplification, so you can mix a track on the fly, edit video on location, or enjoy a movie on the go. The MacBook Pro keyboard features a butterfly mechanism - providing more key stability than a traditional scissor mechanism, along with greater comfort. This 13.3" MacBook Pro with Touch Bar now features a keyboard with a quieter typing experience, and the spacious Force Touch trackpad gives your fingers plenty of room to gesture and click. Box Dimensions (LxWxH) 14.5 x 10.5 x 3.75"
13.3" MacBook Pro with Touch Bar (Mid 2018, Space Gray) is rated 4.7 out of 5 by 183. Rated 5 out of 5 by Roy from Learning experience I wanted to replace my 2015 dual core with for gigs of ram to get a faster quad core with 8 gigs for improved performance and speed. I learned that with surfing and email their is no major difference even though the older is a 1.7 gigahertz processor and the newer a 2.7. However for graphics and rendering the new pro beats hands down. I see a little difference in the screen going to the Retina display but not a game change. For normal everyday use word processing, email, surfing, photo viewing not worth the cost to go pro. But if you are in to imaging and rendering movies etc. I’d say yes. I was a little disapointed in regular use. B&H exec lent price, shipping and support. Rated 5 out of 5 by Michael from Might be the perfect computer Since 2010, I'd used 15" computers...this year, felt like it was time for a change/a little downsizing. This 2018 13" MacBook Pro is the perfect machine for me. Though I went from 16GB of RAM to 8GB, the 500GB SSD easily makes up for that in my usage. The screen is perfect; macOS Mojave runs well, and the machine is light yet sturdy. I have a dingus or two for USB-C conversions, and have no issues with connecting anything external. The onboard graphics is more than sufficient; I can run Windows in BootCamp without issue. The Core i5 processor is terrific. Overall, this machine is a win. I use it as my home computer--consisting of the usual tasks (Email, web surfing, social networking) as well as heavy iTunes usage, editing pictures in Photos/videos in iMovie, and streaming video. Rated 4 out of 5 by Arash from Great product, good price, OK battery I really like this laptop, it is what I needed: an ultra-portable computer with extremely nice built quality, light and presentable in meetings. However, right off the bat I realized the battery is not as good as Apple advertises it, and I don't even do CPU intense tasks... just web browsing, emails, documents editing, simple accounting, etc. So for these tasks I expect it to take me through a work day away from charger. However, getting 8 to 10 hours of straight movie watching and other tasks is definitely out of reach. Overall, I am happy with the machine because it is doing what I expect it to, just getting used to it as I am a first time Mac User. Rated 5 out of 5 by Shane from I LOVE THIS THING SO MUCH!! This Mac is everything and more that I was hoping for when I bought it! Its a beautiful piece of machinery and performs amazing!! If your thinking about getting it, get it you wont regret it at all! I have been a PC user my whole life and switching to Mac was pretty easy and after owning this thing for 2 weeks I never plan on going back to PC now. Everything flows effortlessly and it just works. I got the i7 16gb ram 512 ssd model and its super fast, and I LOVE the Touch Bar. I think its super cool and really fun to use! Cant wait to get iPhone and really getting the two to talk together. Thanks B&H for your helpful sales staff you guys rock! Rated 3 out of 5 by Uhl from Apple is on a downward spiral Sure it's thinner and it still has the best trackpad of any laptop, but... Battery life is poor. I get no where near what I got on my mid-2013 13" MacBook Pro. Having a fast(er since I opted for the 2.7) multi-core processor is a blessing and a curse. Sure it may be faster, but I find that when I'm doing "real" work, it drains the battery. I can litterally watch the percentage tick down. For watching a locally-stored video, yes you can get 10 hours (I tested to make sure). But when you're doing anything more than that, it ticks down pretty fast. The Touch Bar is useless to me. I have it in permanent function key mode, the only thing good about it is the Touch ID reader, but even that feels mushy and you still have to type your password for admin functions. But you _have_ to get at Touch Bar version if you want 4 USB C ports and the faster processor. Keyboard does take some getting used to, but it is quieter than the 2016 and 2018 models. I wish they stopped making them thinner and just improved battery life and keyboard travel. Rated 4 out of 5 by Laurel from Powerful, but Noisy Fan I need a computer with a small footprint because I travel for work constantly and need to take other equipment with. So I know I'm sacrificing the maximum amount of power I could get from the new 6-core 15"s, but ultimately for my needs (maximum portability) the 13" is better. The processor is great and can handle a lot before major CPU lag comes into effect. I use mainly for audio production and office work. One major caveat is that the fan starts whizzing into a frenzy even with just Chrome open, or when my DAW is at more than 20% CPU usage. It's not the end of the world, but I am used to the dualcore 13"s not making as much noise. I guess it's to be expected from the quadcore but I hope this isn't a sign of a larger issue. The new keyboard is SO much better, as well. Rated 5 out of 5 by Christopher from Great little computer - happy I went with the 13 over the 15 Im really pleased with my new 13 MBP with Touch Bar, i7 and 16GB of ram. I would have preferred a fan-less computer, but no macs with this kind of power are available without fans. So far it has not heated up and Ive only heard the fan a couple times during software updates. I actually like the new keyboard, which surprised me. I can type very quickly and accurately on it. I had hoped to get the new MacBook Air but when they launched it with weak specs I knew I had to go with the MacBook pro. I was between this and the 15 but decided on the 13 and it is really nice how it fits in my bag. Battery life has been very good so far. Rated 5 out of 5 by Brian from Rediscover Joy of Computing I had been working on a MacBook Pro that was 6 years old and was making work sluggish. I have loved basically every aspect of the 2018 version I am reviewing. I chose the Pro over the Air to have the processing power for making videos when for most tasks I do the Air would have been sufficient. As a result the battery life is shorter, but I new that was a trade off before I bought the Pro. I move between tasks quickly and efficiently now, even with multiple apps open. I am a fan of the keyboard now having the silicone membrane protection to keep out dust and debris. My experience with the website and the purchase through B&H Photo was seamless. Does it come with worldwide warranty for 1 year ? Is it possible to choose Russian keyboard? Are these brand new or refurbished/second hand? This is a brand new, unopened product. All products purchased at B&amp;H are brand new in the original factory box including packaging, all factory included accessories and factory warranty, unless otherwise stated to be USED, Refurbished or Demo. This would come with a 1 year US warranty. How can I get the product&rsquo;s purchase date to check the service and support coverage? Your warranty and coverage would start from your date of purchase, as long as you register it and show your bill of sale. I ordered Office 365 from B&amp;H. A box with internet download instructions, came with the computer. This is newest version and new? At this time, this is the latest and current model. Can I get it delivered to India? If yes, how much do you charge for it? I am very sorry but as per Apple's request, B&amp;H is not able to ship Apple products outside of the USA.